I admit it. I’m a closet 911 lover. The recent Porsche craze is definitely to blame. The more I come across colourful and unique takes on air-cooled 911s, the more I want one. 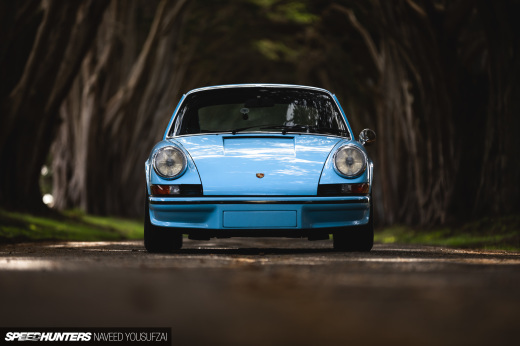 The lure is undeniable, and if you like cars you cannot possibly dismiss the sort of dynamics that old vintage Porches offer. They are light, powerful (depending on model), beautifully simple and unique in both mechanical layout and the subsequent way that they drive. Spending an evening in Tokyo with Magnus Walker chatting about cars with likeminded people, has done nothing but poke at the inner urge. 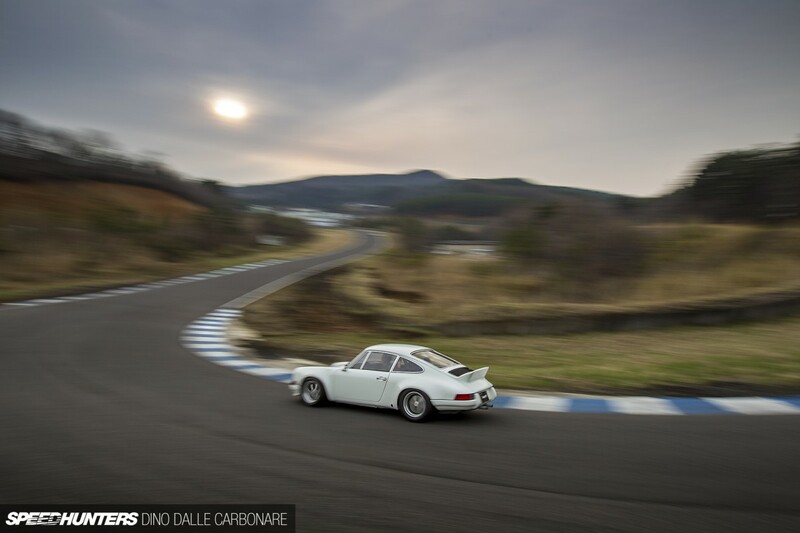 And the great thing is, I haven’t even really begun to scratch the surface of what the air-cooled scene is all about here in Japan. So I thought I’d start fixing that, and come back to you with one of the greatest examples of a classic 911 that I’ve found here in Japan. This is a car that impresses for the both the way it’s been restored and cared for, and the story behind it. This 1972 RSR replica belongs to Mamoru Ogose, the man behind one of the biggest successes in the JDM tuning word – GruppeM. To many of you, GruppeM will be a brand that signifies quality, and Ogose-san was right there at the beginning of the tuning boom in the ’80s. While the business initially concentrated on Japanese cars, Ogose-san quickly steered his business towards imports. He really made his mark when he began to import K&N filters into Japan, and that led to GruppeM designing and manufacturing its own very successful line of air boxes. On top of this he has brought in a ton of other foreign products into Japan, helping shape and steer the scene towards quality. Honda NSX fans will surely be familiar with the GruppeM supercharger kit that Ogose-san developed – a sought after upgrade to this day. 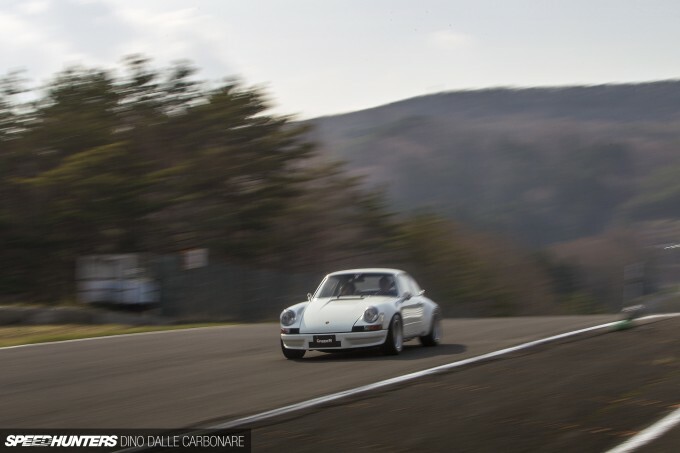 With a business grown out of his own passion for cars, it’s not surprising that there has always been some interesting machinery in Ogose-san’s personal garage, and this 911 was one of his very first cars. As you might imagine then, with over 20 years of development and refinement, it’s been sculpted into something rather special. Like Ogose-san told me though, it’s unfortunate that he never has enough time to actually play with it on track, and if I had to wait for him to actually take it out for a few hot laps to feature it, I’d be waiting for a very long time. With an empty Ebisu East Course to play with, the day couldn’t have been better. I even sat in for a few laps as the mechanic took the car around the undulating course to put some heat into the engine and driveline. With the sun cresting the surrounding mountain tops and a warm veil of light cast over the valley, the timing really couldn’t have been more perfect. The 911’s exterior simplicity was beautifully highlighted. 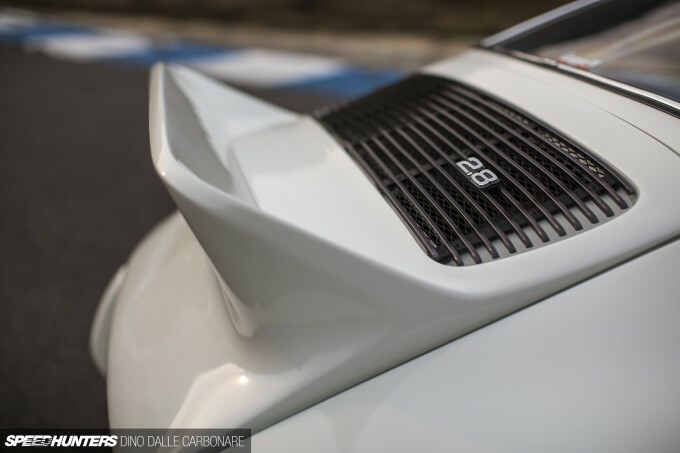 This is a shape we’re so familiar with these days, expressed in its most basic of forms and wearing the right sort of enhancements to denote it as a performance variant. 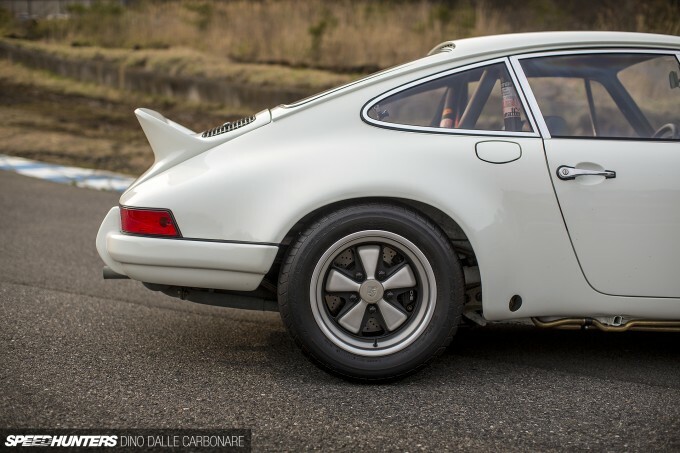 The rear boasts those wide fenders that Porsche had to homologate for use in racing, and originally graced the sought-after Carrera 2.7 RS. It’s not hard to see why this has become the most replicated look for a vintage 911, the ducktail spoiler completing it all with a lovely subtleness. Just like the car in its most basic of forms, Ogose-san never intended to get lost in the details. Quite the contrary actually. His goal was to create something that would represent a vintage take on the modern-day 991 GT3 – a performance-oriented special, purely built to offer the most undiluted performance driving experience. That’s why the car sits on period-correct Fuchs wheels for a start. They’re 15-inch in diameter all around and plenty wide to fill the pumped wheel arches. There’s a nice amount of dish on the 11-inch rears, shod in appropriately-sized 285/40R15 Pirelli P7 rubber. The fronts are a little narrower at 9-inch and run the same model of tyre in a 225/50 fitment. It sits just right on a set of specially-built Bilstein dampers mated to springs that make the most out of the performance at hand, and keep the car flat through the turns but never upset the handling balance. Considering that car hits the scales at 1000kg, that was very important, so damper valving and spring rates aren’t too aggressive. 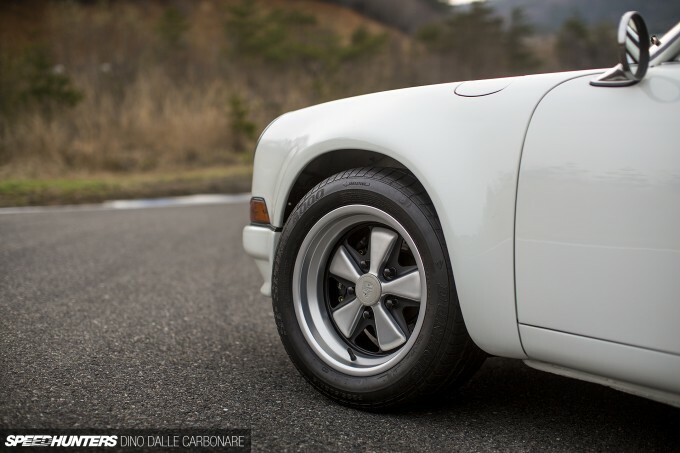 Braking is taken care of by 930 Turbo 4-pot calipers that are fitted at each corner with cross-drilled rotors. It’s an an exercise in balance. The car had to look just right with those RSR touches, but at the same time be backed up with the right sort of capabilities. Believe me, this is not a car built to wow people at a stance-oriented meeting – it’s built solely to offer the most fun behind the wheel. 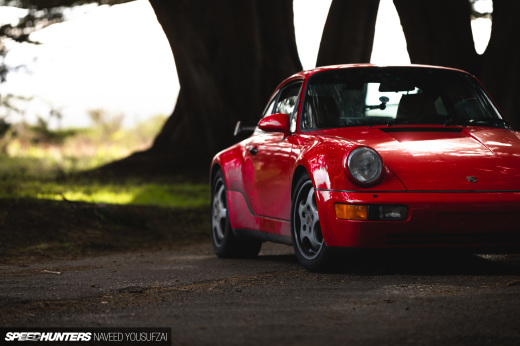 It’s hard to categorise a car like this, but it’s a classic homage that’s been fine tuned over time with upgrades that don’t make it any less of a Porsche. And then there’s that 2.8 badge on the grille. Lift up the lightweight FRP engine cover and you are treated to quite a sight. Wait a second, what did you expect? Lots of chrome, polished aluminium and velocity stacks? No, Ogose-san has preferred to do away with any sort of component that would make the car look any less of a classic than it is. The 1972 base engine has been rebuilt, bored out to 92mm and stroked to 70.4mm to give it a swept capacity of 2,808cc. It runs a static compression ratio of 10.5:1 and is fully balanced and blueprinted. Yet it all looks pretty stock in there. The engine can rev out to 8,000rpm and develops 300PS. So that’s 300PS-per-tonne remember – not too far away from the 330PS-per-tonne that the 991 GT3 comes packing. Hopefully that puts the potential performance of this car into perspective, but even more so how it would feel through your hands as you wrestle it from corner to corner. 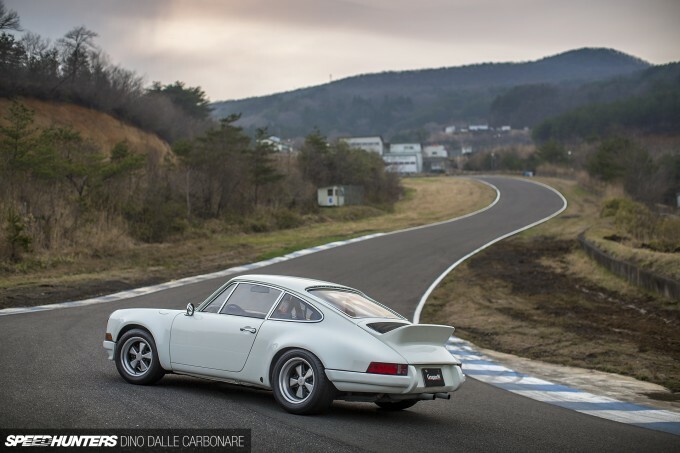 That power is channeled to the rear wheels via a 915 5-speed transmission, which does away with the dog-leg first that the original car’s gearbox came with. Oh and yes, that fifth cog does help in extracting maximum performance. 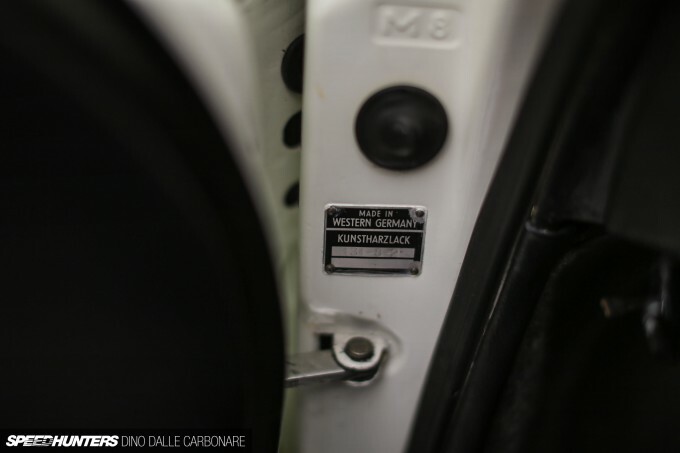 Check out the ‘Made in Germany’ label stamped into the taillight surrounds. For vintage parts, all of these things have held up to the test of time rather well. 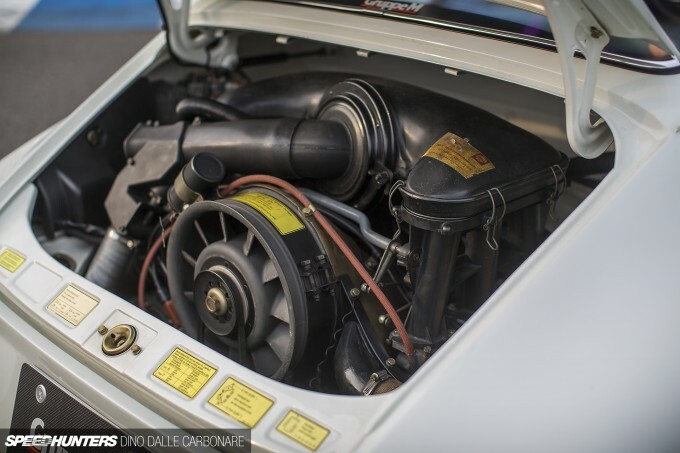 The ducktail engine cover is a piece that GruppeM produces, along with a long list of goodies for most generations of the 911. 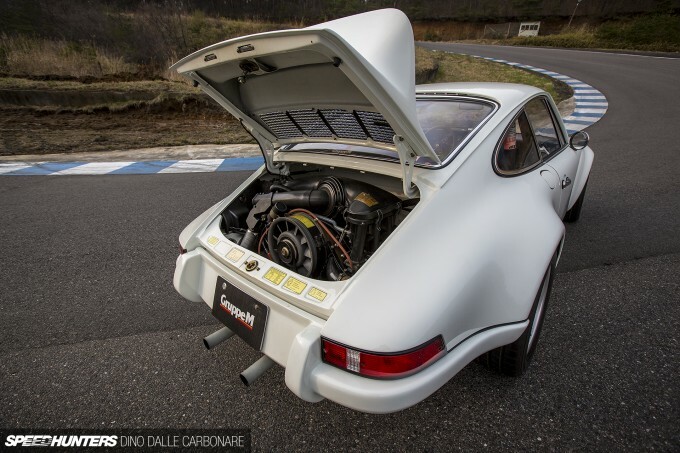 The exhaust is as period-correct as the rest of the parts used in the build, and features a pair of elongated center pipes amplifying that raucous signature rasp that characterises Porsche air-cooled motors. Keep the revs high however, and it creates a wonderful mixture of mechanical noises that merge into an intoxicating high-pitched wail. It’s not too hard to see why 911 guys are so attached to their cars. 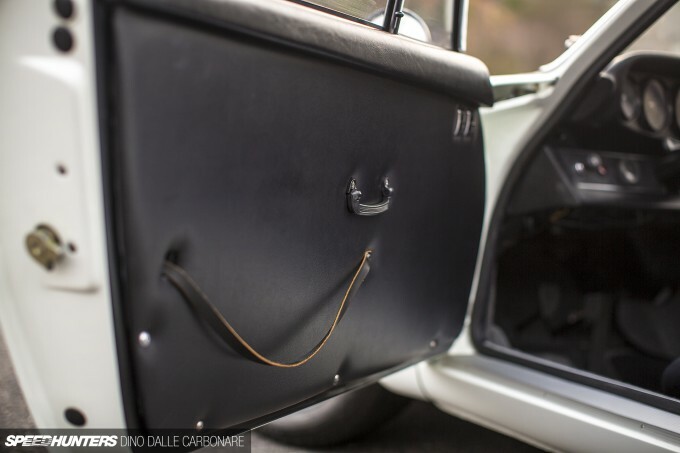 These cars ooze character visually, tacitely and aurally. The underlying sense of simplicity is carried through into the interior with a few select additions. 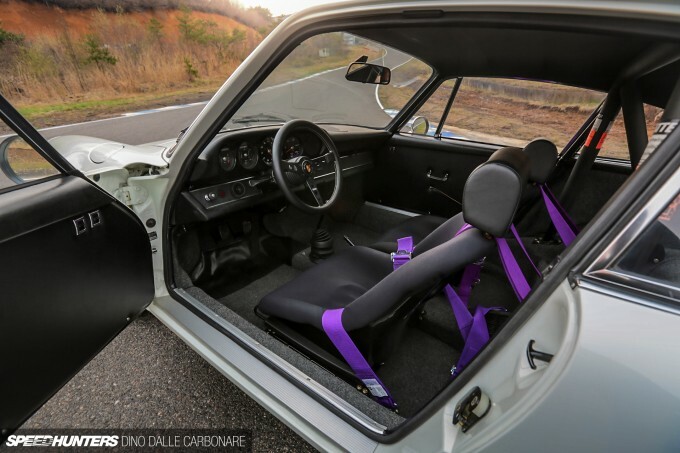 An RS pull-strap would have been far too much of a modern addition to the flat and featureless door card, so this leather strap works as more contemporary touch. Interestingly enough, the electric windows have been retained. Now there’s a mark of authenticity! Step inside and you are greeted by a pretty basic and familiar dash layout, the black-on-black interior suiting the feel of the car rather well. Like I mentioned, this is a project built for pure performance, so colour coordinating trim would have been a trivial exercise. 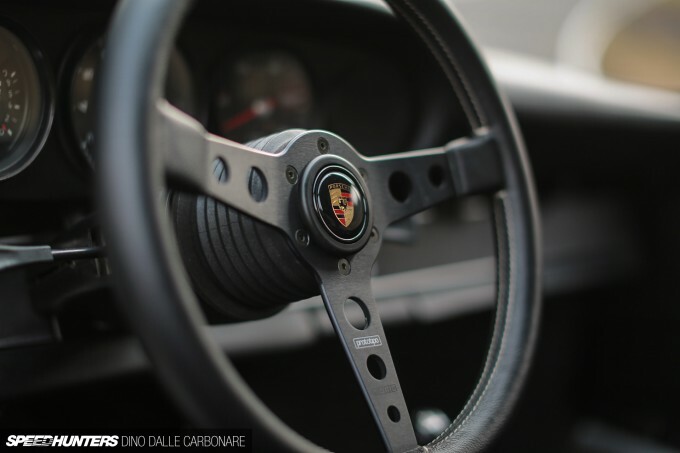 A Momo Prototipo is the steering wheel of choice for these older cars and it’s hard to argue that its design isn’t the perfect match. 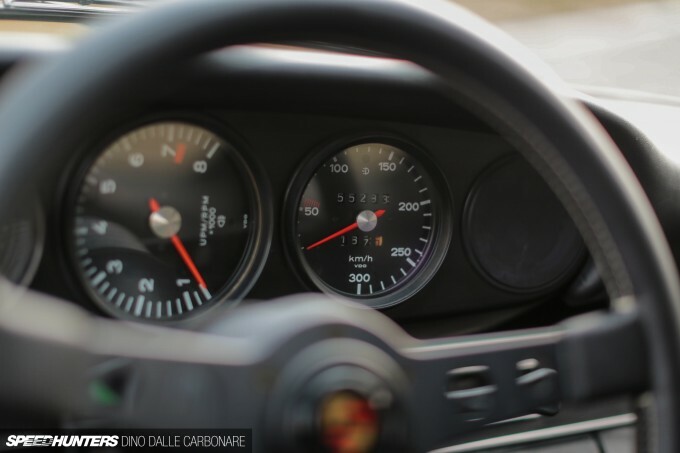 Behind it, the tachometer has been rotated so that the 7,000rpm mark is lined up vertically. This is one of those touches that we see on a lot of Porches in Japan, and something the old highway racers used to do too. 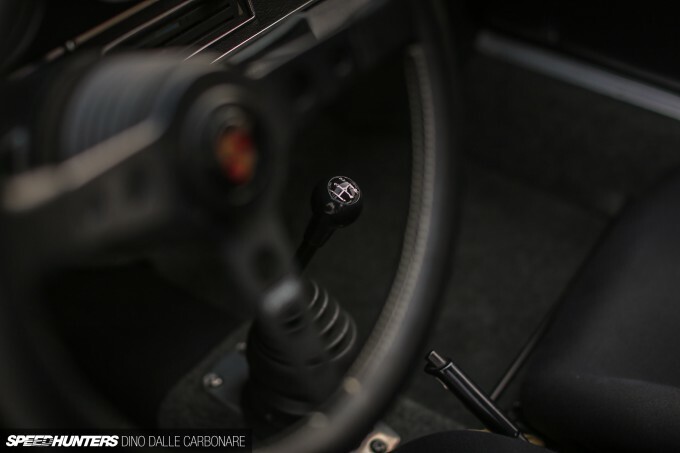 The shifter has remained stock, except it’s now sporting an 5-speed H-pattern knob from the 915. The car runs a certified half rollcage so both rear seats have been deleted – or rather covered in the same grey carpeting the rest of the floor is upholstered in. 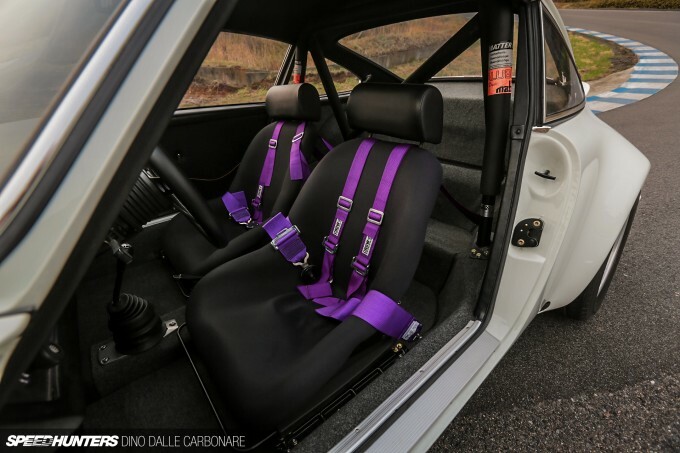 Race seats and Crow harnesses are the final touches, and although they slightly go against the stock feel of the car, they were purposely fitted to hold both driver and passenger tightly in place when the car is being driven as it was intended. 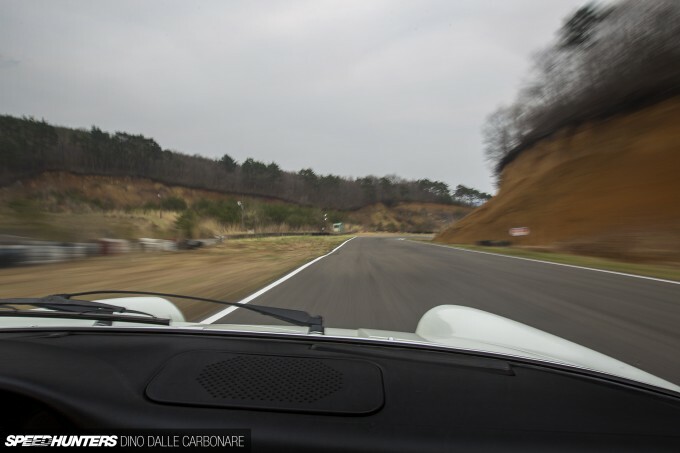 Ogose-san has turned his favourite Porsche from history into a true vintage performance car that stays loyal to the RSR it perfectly replicates. It’s an impressive piece to grace anyone’s private collection, so the most surprising thing is that he has another one that looks almost exactly the same, but built in a slightly different fashion. One body style that can rightfully be deemed timeless. What a beautiful car. Awesome photos Dino. Also, I saw your IG post - congrats on the Hasselblad $$. Gorgeous car and nice write up. Where on earth did they find original P7's, let alone in 285/40r15?! Only tires I know that are still available in that size are the P7 Corsa's and Yoko V141's. 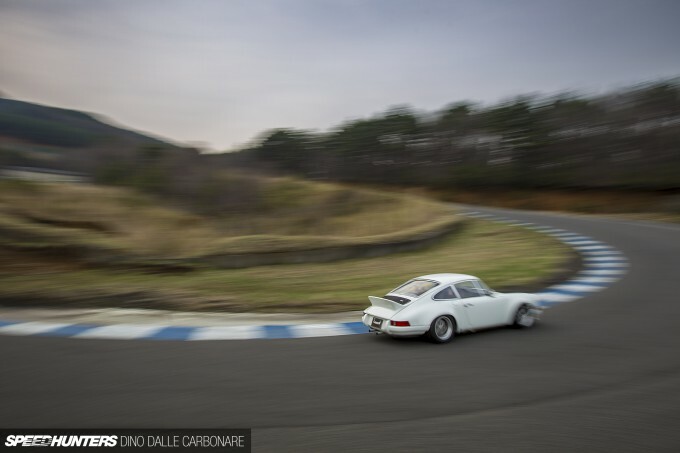 I remember saying that the BBi motorsport 911 about 3 months back was my all time favorite 911. So...there's a mistake on the brand of the tires. You can clearly read Dunlop SP Sport 8000 on them...not Pirelli. Beautifully done, great shots! 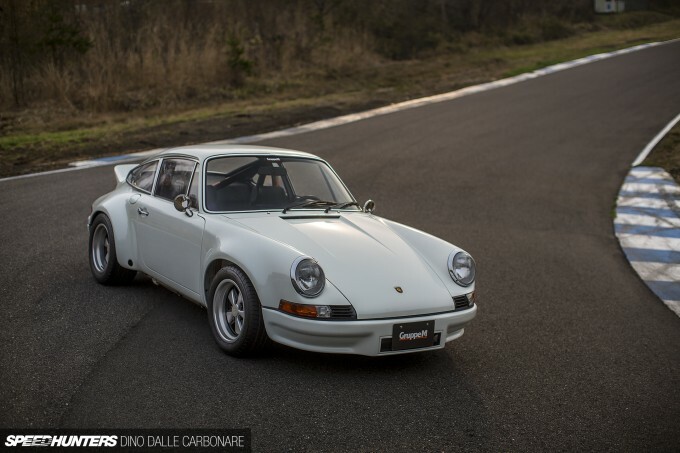 Right now the slantnose seems to be my favourite 911. Posts like this are the best. No attempting to appeal to others. A clean, timeless, functional build that will look as good 20 years down the road as it does now. Please, more cars like this. Such an awesome feature, I loved seeing this car in person! Clock delete! The only thing cooler is the Heuer timers in its place... Glorious machine, well captured. Makes me miss my 2.7 even more. Just to clarify, you say, "specially-built Bilstein dampers mated to springs," you mean the car has been converted to coilover? I just thought it was an oddly lengthy way of saying custom coilovers. This looks so good, awesome write-up and photos! So many new wallpapers this week. Now I have to change them everyday. Great job Dino! Great car, but the Audi "2.8" badge needs fixing! That is absolutely beautiful, probably my dream car. Did you get any video? I would love to hear it howl. 1: the color of the Crow Harnesses pop way too much. This car is absolutely peach, subtle yet effective. 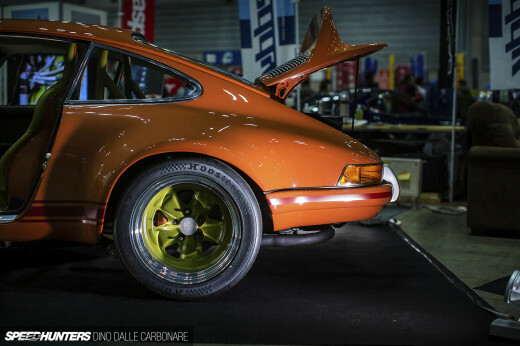 You can't go wrong with the classic Porsche look. I can only imagine this must be wonderful to drive on the track. Awesome shots Dino! matthewyaa It felt sublime from the passengers seat haha. Thanks! 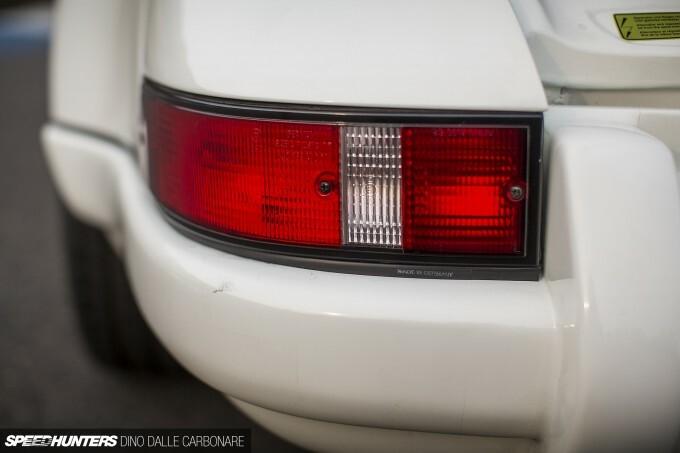 CoreyKononchuk Have you spoken to any late model Porsche owners? Hopefully, your car has already had this issue addressed or has a good warranty...but those cars have major issues with intermediate shaft bearing failures. I've had extended conversations people within the Porsche community. 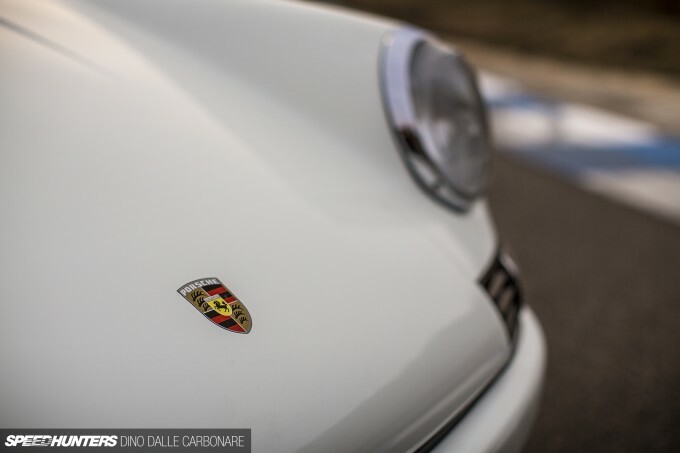 One particular person ("anonymous" Porsche club vice-president) even spoke to Porsche engineers who refuse to even address a resolution to the issue. Yeah, I was bitten by the bug too, but utilized a different four-wheeled remedy. Feature that F355 immediately. Do it. I, for one, love the accent provided by the Crow harnesses. Can't deny the purp. Amazing lens work, too! Thanks Dino. The 1972's came with 915 boxes, 1964-1971's had the dogleg 901's. But thanks for featuring, wonderful car and pix. If you want to overload on these kind of builds, go check out the Rennlist or Pelican Parts forums...! Can't stand a mis-spelt Porsche. First Para, fourth sentence. Thanks, yes I have had an LN Engineering IMS bearing installed as a precautionary measure.